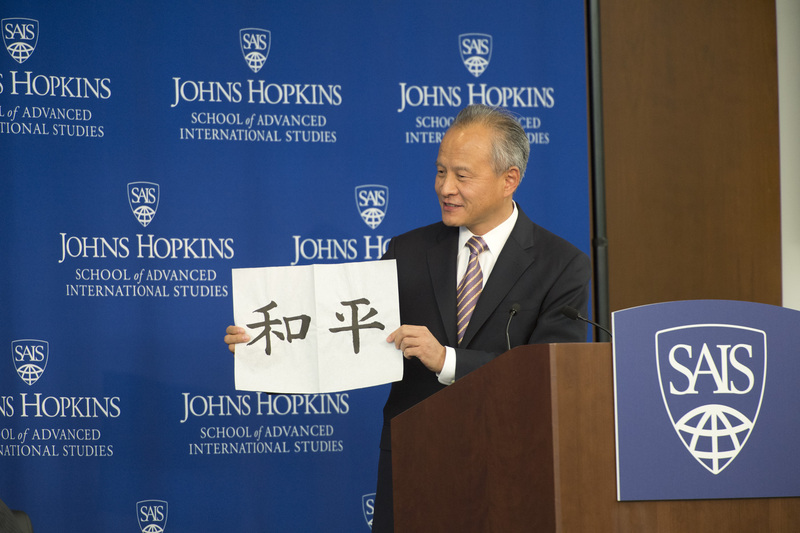 “The task of the ambassador is to be a messenger,” said Cui Tiankai in his address at SAIS Washington last Tuesday, in one of his first public appearances as the Chinese ambassador to the United States. The ambassador was articulate and personable, by turns humorous and thoughtful. His presentation seemed to achieve that time-honored benchmark of diplomatic rhetoric: the ability to linger in the memory as a pleasant (albeit vague) conversation, neither controversial nor unexpected. It was a surprise, then, to see China Central Television’s coverage of the event with the headline, “China warns Japan against leading Asia-Pacific toward confrontation,” or to read Japanese Chief Cabinet Secretary Yoshihide Suga’s direct response to Cui’s comments. Cui stated in his speech that there were some in Japan who attributed Japan’s defeat in World War II to the US’ atomic bombs, rather than the joint efforts of the Allied Forces. This same group, continued Cui, believed that cultivating Japan’s relationship with the US could come at the expense of relations with other countries, particularly in Asia. Suga later replied that Cui’s speech was Chinese self-promotion and not worth commenting on. This row per se is not particularly surprising; China and Japan hold different opinions on a number of issues, and trade barbs regularly. What is noteworthy, however, is that a public event ostensibly about US-Chinese relations had an impact that is a) more relevant to China’s relations with Japan than to its relations with the US and b) counter to the stated goals of Cui’s presentation – peace and stability. The issue is not whether or not Cui’s assessment is correct, but rather whether or not the US and China are fully utilizing public fora in their attempts to deescalate regional tension, make preparations for crisis management, and realize both sides’ goal of breaking the historical cycle of great power rivalries. Diplomacy is sustained by high-level meetings and political conferences, but also by diplomatic presentations at universities, dinners with foreign academics, and a number of other opportunities for public discussion. The messenger does, after all, need an audience. On Tuesday, Ambassador Cui drew a rough outline of China’s history, objectives, and values. He emphasized China’s dual desires for peace and independence, as well as the role the “century of humiliation” has had in shaping China’s decision-making process. Cui noted that a respect for history is essential in understanding and shaping international relations. Cui’s approach applies to public fora as well – especially if the US and China are as serious about improving their bilateral relationship as they have claimed. The recent history of the US and China has been marked by caution and uncertainty on both sides. While progress in the relationship has been positive and undeniable, developments such as the Hainan Island collision in 2001 and tensions in the East and South China Seas underscore the complexity of American as well as Chinese objectives in the region. If the US and China are in fact the “G2” of the G-20, the two decisive powers in the international system, then Sino-US public fora offer a space which international institutions do not quite cover. They offer a chance for academics, diplomats, ordinary citizens, policymakers, and students to focus on the US and China without diverting attention to separate issues. The scholar Nancy Bernkopf Tucker has written that the biggest problem in American policy toward China, over the last two decades, has been that of incoherence. The primary reason for this incoherence is the existence of American sectors with far different interests in China, for example, commercial and security groups. The same might be said now of leaders in both Washington DC and Beijing; that they do not always participate in public fora in a constructive manner, or that they have demonstrated an unwillingness to treat such fora as essential. The effect of this treatment is that public fora may become inadvertent sources of tension or, from a more cynical perspective, platforms for sending messages to third-party countries. Neither option is productive; both run the risk of obscuring the positions of the US and China in their bilateral relationship. “The task of the ambassador is to be a messenger,” said Cui Tiankai. “But sometimes,” he continued, “the messenger is the message.” After Cui’s talk on Tuesday, it is not clear to whom the message was directed, nor for what end.